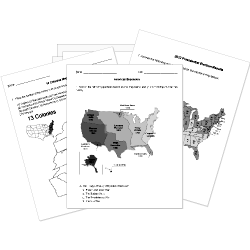 You can create printable tests and worksheets from these Grade 1 Civil Rights questions! Select one or more questions using the checkboxes above each question. Then click the add selected questions to a test button before moving to another page. Who was the first African-American to attend a black and white school? What did Dr. King do for a living? What part of the bus were blacks supposed to sit in? Who was the first brave African American girl who went to an all white school by herself? Why did Rosa Parks go to jail? What is the name of Martin Luther King's most famous speech?